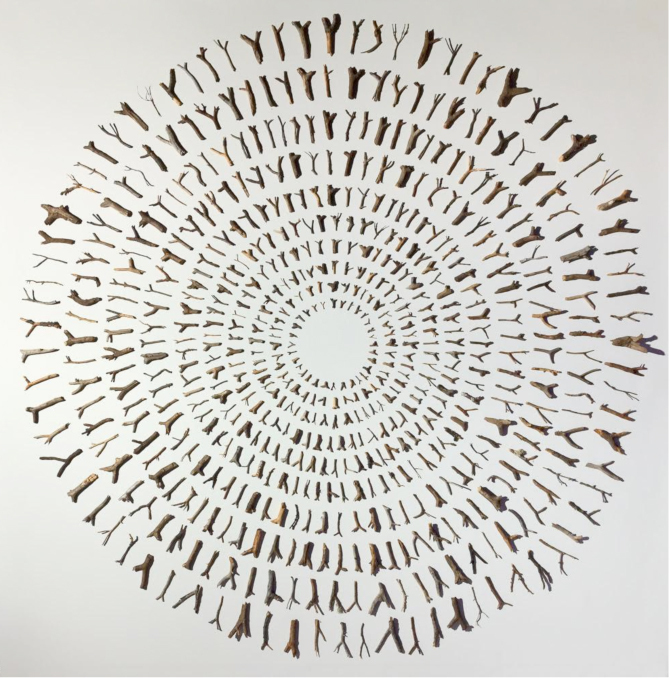 One Thousand Arms of Compassion by Dominique Mazeaud, 2010. The outdoor installation is 9’ x 9’ and the material is Y-shaped twigs. Photograph from Alan Eckert. When I tend to the world from the heart, it becomes poetics. Poems of praise may come to my lips at any time. I can be touching something as mundane as a broom. But when I wrap my hands around the worn wooden handle, so polished with age that it glows, I can feel the life force of the broom handle. I remember that the handle was once a tree. And then I travel beyond the confines of my room and my sweeping… It’s as if I see the sun shining above and the soil below exuding its own kind of invisible light. I feel more alive when I think in terms of these other dimensions. Envisioning the dance between outside and inside, high and low satisfies me beyond measure. My love for “mater-ial” takes me far and wide. With lightning speed I travel in my mind to an assembly plant in China where a thousand workers toil. The insane reality of this work environment was recently portrayed in the documentary Samsara by Ron Fricke. In one horrifying scene he accelerated the already inhuman speed of the repetitive gestures, each sequence a few seconds, a quarter of a minute at most, underlining the fact that the workers themselves have become machines. I am a hunter-gatherer. Like a child, I cannot go on a walk without bringing back some little treasure from Mother Nature. It may be a strand of grass, a heart¬shaped rock, some powder¬fine sand, a small branch with lantern¬like seedpods, a clump of tender velvety moss, some unusual-looking twigs. This habit of mine evolved into a work I titled One Thousand Treasures du Jour, a precious celebration of the miracle of life. It is an installation of one thousand tiny things, mostly from Nature, that bless our days, from seed to pebble to feather, all fitting 2” x 1.5” gray cardboard receptacles. I used the shells of small Diamond match boxes which in their delicate craftsmanship (as industrialized as the process is) are a good ‘match’ to the spirit of my work. Like all artists, I take pride in my materials. Anything can be a material for making art – even tears. I list tears as a ‘material’ on my website. Tears are grace that flow from pain. Tears are the grace that leads to joy… Tears are both petits trucs (ingenious forms of creativity) and have become petites amies (literally little friends). My love for the small crept into my performances when children’s shoes became one of my ‘materials.’ This wonderful association began with a pair of white Mary Jane shoes. They were the first ‘gift’ I received from the river when I set out on The Great Cleansing of the Rio Grande, a ritual performance I did monthly from 1987 to 1994. When I realized the vast threat to our waters and what this meant for the Earth, my heart broke. Out of this brokenness, my heart became a huge delta emptying its precious (yet to this point unknown) sediments into the sea of my being, and a sudden inspiration to speak on Her behalf was released. As I ‘walked’ the river (I began with the nearly dry Santa Fe River, walking my way toward The Great River), I received many ‘gifts’ beyond the trash that I was collecting, sometimes unspeakable trash such as syringes or dildos. Perhaps the most surprising find was a statue of Jesus which ended up being exhibited among other found objects to tell the story of the forlorn river. Shoes were common, however, and their size increased as time passed, a fact that did not go unnoticed. It is true, I did a lot of growing up during the seven years of my river performance. Undoubtedly, I had found my true mother. 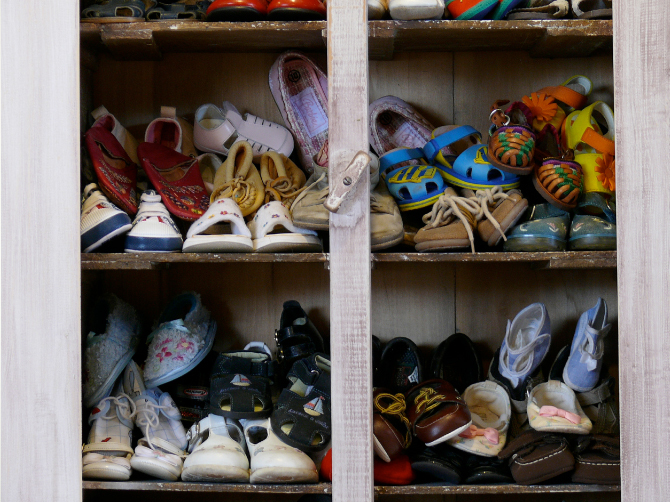 The little white Mary Jane shoes made me step into one creative period, as years later, a pair of shiny red patent leather shoes, ‘winking’ at me from a thrift shop shelf, laid out another round of work. They inspired the second version of Tears of the World. In its original incarnation, Tears of the World was a one-week performance/vigil which I did in the winter of 2001 on the occasion of the tenth anniversary of the first bombing of Iraq. My devotional watch was simple. I stood on the Santa Fe Plaza in front of the Soldiers’ Monument for several hours a day. I dressed in black and covered my face with a white mask. Right below the hole carved out for the left eye was a large bead in the shape of a tear. In my hands I held a bowl filled with water, symbolizing the sorrow (read tears) felt by people all over the world about what was occurring in Iraq. It was a very cold January and one day, the water in my bowl froze. No mode of creation is more direct or naturally arrived at than the accumulation and agglomeration of materials founds close at hand. I regard everything from shoes to cabbage to keyboard as noble when put in the context of the extraordinary creation they and I are part of. Whether or not we are aware of it, we are all caught in the dance of attraction. The first expression of wonder is through the senses… enthralled by the miracle of e.v.e.r.y.t.h.i.n.g. First I praise the “mater-ials” that serve me. I am not a compulsive hoarder, I am a grateful devotee. .My dearest wish is to go SLOWer, taking time to register and praise e.v.e.r.y.t.h.i.n.g. One of my cherished materials is soap. I like clear, unscented glycerin-based bars of soap. When I release the angular shape from its clear paper cover, I am taken by the sharp edges, an intriguing contrast to the flesh-like velvety feeling of the soap. I experience these bars of soap as poems of (divine) mater-iality. I delight in the way their edges soften and become rounder over time. My pleasure deepens when the soap dwindles down to a transparent sliver as its color changes from gold to yellow to ocher. To hold this piece of soap in my hand is to also hold it in my heart…and when I hold it up to the light, I see a stained glass window, or the amber bead of a funky necklace. Or maybe I just see a fragment of soap. It is worth being admired for what it is. Perhaps I will be inspired to make something of this soap someday, but for now, the material is matter… is Mother. When I get up during the night and fumble my way to the bathroom in my old adobe house, my hands touch the smooth, rounded walls, reminding me of my smooth, rounded bar of soap. Touching the walls, I feel touched by tenderness. Another beloved material is the match. Why does match, the tiny word-being that speaks of fire, draw so much of my attention? Match, as minute as she is, speaks on behalf of light. If Light is Spirit, no wonder I have a thing for match. Match touches many different parts of me. Visually, she is utterly precious in her pale smallness, carrying the memory of her mother tree, the aspen of my home in the west. Aurally, she emits a slight and hollow sound, a cross between an Oriental temple instrument and an Australian rain stick. Then there is the olfactory, that sulfurous emanation which may require a long nose like my own typically long French one. This is not to forget the tender smoke she exudes, a fuming vocabulary of sorts. But then, every being has many sides to its beingness. Burnt matches are one of my collectibles. I began this particular collection over twenty years ago, and it has gone way beyond my need for praise.I wonder how long it will take me to gather enough burnt matches to reconstruct a mother aspen tree—a conceptual work at this stage, yet one I seriously hope to realize. This would be my way of celebrating and thanking my kin from my deepest ‘skin,’ my heart. For now, the tiny sticks are enchanting, their lightness, their spark, the delicate ‘unmatchable’ sound. Each strike, a mini ceremony in itself. For Marcel Proust, it was the taste of a madeleine dipped in tea that made him revisit his past. It is sound that moves me, and I can’t decide if it is the sound one little “fire-stick” makes when dropped on other matches or the psssssss sound of the incandescent tip put out in water. I confess I have a special liking for the French word for match, allumette, which is close to the the word illumine, for light is how Spirit manifests. Match actually comes from the Old French mèche (the wick of a candle). The beauty of being bilingual is that the world becomes more expansive, which increases the potential for existential joy and wonder at the mystery and oneness of life. Rags are another favorite material. “Better go to heaven in rags than to hell in embroidery,” reads an old proverb. When I fold newly washed rags, I journey into the past and reconnect with them as old familiars. It is a celebration of their beingness. A love song. Occasionally, an exercise in peacemaking. The caramel-colored flannel night gown that once kept me warm is now a tattered square for reviving old wooden furniture. The seasoned remnant of a cotton camisole with an embroidered panel now lightly strokes the bathroom mirror. The kitchen towel, part of the trousseau that traveled with me in an ocean liner trunk on board the S/S France in 1967, has lost much of its natural linen goodness, but is still good enough to gently caress the trees that willingly or not sacrificed themselves to chairdom. Rags for me are ageless poems made of cloth. My materials are deeply private objects, personal matter “altared” and transformed by the ceremony of a shared experience. I began collecting things from day-to-day life in 1989 when I moved to a small log cabin North of Santa Fe. First it was soap and matches, then hair—Life/Art gestures that translated into the realm of practice. Every time I pick up a strand of hair, whether from my shoulder, a coat, a pillowcase or the comb after combing out my newly-washed hair, I think of the final breath before death. Like a Zen nun carving her tombstone, this practice helps me prepare for the reality and sacredness of the last moment. I have conceptualized a performance for these last moments I call The Last Performance Project. My goal for this work is to spin a thread made of my hair to be used in my “last performance,” my funeral. Hair and thread, representing life force and human destiny, set the stage for the living to transcend the pain of losing a body, while reaffirming the connection of life to Spirit. I am not attached to what will happen during this “last performance.” However, I do find this image beautiful and inspiring: a circle of “mOrners” (mourners awakening to the Oneness of All Life) holding the spun thread of hair, each person like the pearl of a special rosary celebrating the Oneness of All Things, alive or dead. Dominique Mazeaud is an artist whose ritual performances and installations are prayers. 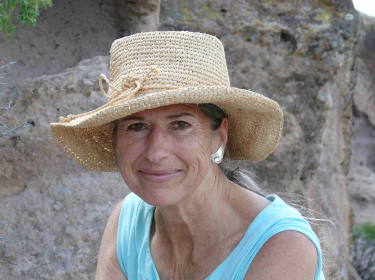 Born in France, she has lived in the United States since 1967 and in Santa Fe, New Mexico since 1987. Her passion is the Earth and her identity belongs to Spirit. Material is matter… is Mother… is an excerpt from a manuscript titled The Spiritual in Art: a heartist's journey. The word heartist is the gift of her quest for the meaning of the Spiritual in Art in our Time which she has tried to answer since 1979. She feels so strongly about matter that she often calls the objects of her life familiars. She can be reached at heartistdm@gmail.com.